Washington (11-1, 8-1) rose to No. 4 in both the Associated Press and coaches polls released Sunday. The Huskies will face Colorado Friday for the Pac-12 title in Santa Clara, CA. Washington advanced two spots from No. 6 to No. 4 in the Associated Press poll and one slot from No. 5 to No. 4 in the coaches poll, both released Sunday. 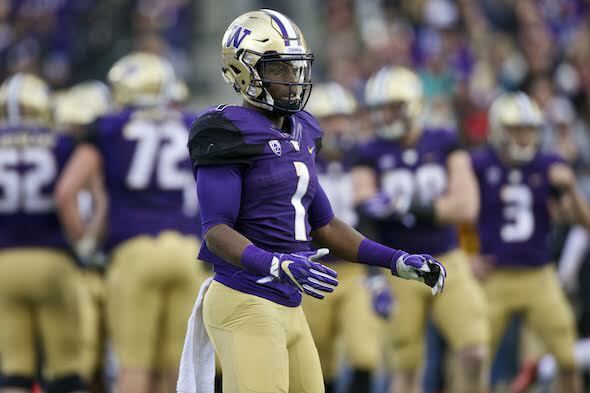 The definitive College Football Playoff rankings, in which the Huskies are No. 5, will come out Tuesday (4 p.m., PT, ESPN). The top four teams in the final CFP rankings as of Dec. 4 will play in the national semifinals Dec. 31 at the Peach Bowl in Atlanta and Fiesta Bowl in Tempe, AZ. The winners will meet for the national championship Jan. 9 in Tampa. Washington, a 45-17 winner of its rivalry game with Washington State Friday in Pullman, received 1,298 points in the new AP poll (1,220 last week) and moved up largely because of Michigan’s 30-27 double-overtime loss to Ohio State. The Wolverines dropped from No. 3 to No. 5. Wisconsin (10-2) also dropped a spot, from No. 5 to No. 6, despite creaming Minnesota 31-17. Alabama (12-0) remained No. 1 with 1,525 points, followed by No. 2 Ohio State (11-1) with 1,456 and No. 3 Clemson (11-1) with 1,383. The Crimson Tide crushed No. 13 Auburn Saturday 30-12, while Clemson erased South Carolina 56-7. Among Pac-12 schools, Colorado remained No. 9 (1,035), wrapping up the Southern Division title with a 27-22 win over Utah. USC (948) jumped two places to No. 12, and Stanford (425) cracked the Top 25 at No. 17. The Utes and Washington State dropped out of the poll, receiving 88 and 35 points, respectively. In the coaches poll, Washington moved up one notch with 1,388 points. Last week, the Huskies garnered 1,297. Alabama remained No. 1 with 1,600, followed by No. 2 Ohio State (1,520) and No. 3 Clemson (1,475). Wisconsin came in at No. 6 (1,298) and Michigan at No. 7. Colorado remained at No. 9 (1,116). Southern California (965) advanced one spot after crushing Notre Dame, Stanford (474) came in at No. 17, Utah (159) fell four spots to No. 24 and Washington State, 23rd last week, fell out of the rankings. Washington (11-1 overall, 8-1 Pac-12) faces Colorado (10-2, 8-1) for the Pac-12 title Friday at 6 p.m., PT, in Santa Clara, CA. The Huskies, an early seven-point pick, will be seeking their first league championship since 2000, when they finished No. 3 in the nation. Washington and Colorado have met 15 times and the Huskies hold a 9-5-1 advantage. UW has won the past six in the series, including 38-23 in 2014.